Well its been a long long week. Iv been of work all week and the plan was to do a bit of work on the sax. First up was lowering the back end. Well the torsion bars where super tight. eventually after three days of wacking and a bolt snaped (after trying the pull method) we got it lowered 50mm. well we thought. it looked like this. Any weight in the car and it was scrapeing. Car went to the garage all day Friday and has now had two new drive shafts and lowered on the front by 45m. I just bought the springs for now see how it does. Went to work in it at the weekend and it feels great. Its a real cold day and yesteday afternoon I came down with a cold but am going to start my work on the car. First thing lowering the torsion bars about 45m/50m-not decided yet. I will post some pics up as the week goes on (if i can find the camera charger) if not i will use my phone. Well it seems winter is back on the way again and the only real thing that has happend to the VTR is a sticker has been added inside to the glovebox lol - Really havn't been spending much on her this year. Well, ain't updated this in a while. Basically the Saxo went a couple of week back and has been replaced by a ph2 Flame Red 172. Wanted one for years. My first 2 car's were Clio's and i alway's looked up to the Sport's. Got this one at a bargain price just need's a little tlc. But honestly for the price i go it at i really don't care! 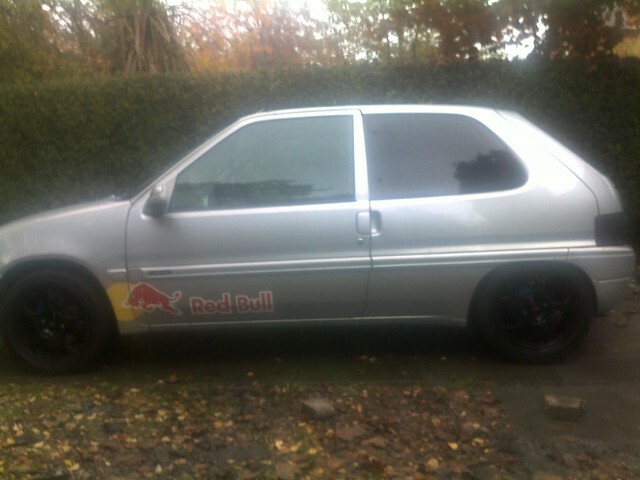 Overall it's 10x the car the Saxo was regard's a daily driver. More comfortable, better built, better engine, handle's extremely well in standard guise. It's just a pleasure to drive tbh. First off, I got the cleaning kit i was after and managed to seal the garage floor and roof so with the regional meet coming up I thought i'd give it all a go. I snow foamed the car first, then washed it with this 2 bucket method i'd read about. The Chemical guys Maxi Suds II plus the Meguires wash mit made nice light work of the washing, the mit just glides over the car and the snow foaming managed to get all the bedded in crap off. I was well impressed with the results of just washing the car with this method and some decent kit! Bought for £1000 on the 28/8/10 with 97k on the clock,all previous MOT's and some service history and receipts. Totally standard with just one or two minor scratches. these include the footwell neons i have put in place and the half tinted rear lights. I'm looking at fitting a turbo kit to my VTR but i'm not really to sure where to start with which turbo will best match........ can anyone help please??? ?